Thomas R. Pero: You bring a unique perspective to the tarpon story. As a young man you moved to Key West in the 1960s before there was a single full-time flats guide living there. And you knew and spent time on the water with many of the old-time guides. Thomas McGuane: When I was first down there in the late ’60s a certain amount of the world that had existed in the 1940s and ’50s was still going on. It was in its last gasp, but I was thrilled I got to see it. Harry Snow, Sr. was still guiding and he was almost blind. Harry Snow, Sr. guided presidents. He went to the Florida Keys and helped build the Overseas Highway. He was bonefishing and tarpon fishing before he had an outboard motor; he rowed out to the fishing grounds. His son, Harry Snow, Jr., was also a phenomenal guide. He was never really in the fashionable inner circle—he was just a native Keys guide, you know—but he was a tremendous fisherman. Somebody ought to talk to him, because he probably has the deepest roots in flats fishing in America. I have not seen him in years, but I did see his boat at the Sugarloaf Lodge about one year ago. It was the same boat he had when I was living there in the 1960s. I think Eddie Gediman must have built it. Pero: What do you remember about those boats? McGuane: The earliest guides like Harry Snow, Sr. had what they called Go-Devils, which were these flat-bottom skiffs that were probably the best poling boat there ever was. But they were highly impractical in every other way—wet, rough, and sinkable. The first of the real dedicated skiff builders was Willy Roberts. I had a Willy Roberts skiff and he built wooden boats on Tavernier Key. He was a conch and a wonderful craftsman whose peculiarity was that he hated painting boats. You could get a substantial discount on one of his boats if he didn’t have to paint it. His family origins were in the Abacos. They had been loyalists during the American Revolution and fled the Carolinas. He came from a long line of boat builders. Most of the guides in the ’60s had Willy Roberts boats. The next wave in the evolution of tarpon boats and skiffs in general was sort of bifurcated. One group was Chestnut Canoe Company hulls that Ted Williams brought down from New Brunswick—George Hommell, Ted Williams, and Woody Sexton all had these. They came sort of nested with loose transoms and local guys would build them up into skiffs. They were a pretty advanced kind of skiff, rough riding, but Hommell had kind of a canopy that he put up over his, so everybody could hide under the sun while they made their way out to the grounds. That was a great boat, a bit wet and rough, but quiet to pole. After that the first of the real nice fiberglass boats came along. They were basically ski boat hulls. The most common one was built by an old carpenter named Eddie Gediman, who built them in an abandoned gymnasium in Miami. Some of those Fibercrafts are still around. It was a great era of on-site experimentation. Among the other boats of the time were the Shipoke and the somewhat legendary Challenger—legendary because the great John Emery fished one. But they were all heavy compared to what we are fishing from now. And then the Hewes boats, I think, were the next thing. They were the first real production flats boats. With all these other boats I just described you had to get somebody to build them up from hulls. 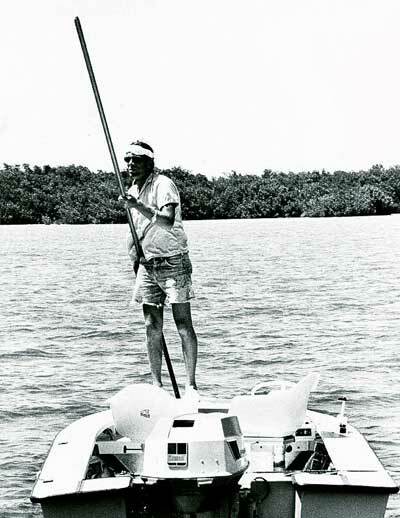 After the Hewes boats were developed there was a builder up in Miami, Wally Cole, who built Guy Valdene’s skiff, which Guy sold to Jimmy Buffet and is now in the IGFA museum. That was the prototype for the Maverick boat. The Maverick is highly evolved since that time. In fact, we borrowed that first boat. It was such a cute little boat—very little freeboard, tumblehome aft. Marshall Cutchin and I borrowed it a few years ago at Key West, and we were surprised it poled like a brick shithouse. I’m not sure it was even that seaworthy, because Gil Drake stuffed it in a shrimp-boat wake out in the Northwest Channel one time. After that, it was the Maverick, still all-fiberglass, and the Hell’s Bay. The latter are built on foam cores. The Maverick is highly evolved since that time. In fact we borrowed that first boat. It was such a cute little boat—very little freeboard, tumblehome aft. Marshall Cutchin and I borrowed it a few years ago at Key West and we were surprised it poled like a brick shithouse. Pero: The first to use Kevlar lamination. McGuane: I have a Hell’s Bay skiff, and I do not see where we can go from there. I once had a Maverick that Scott Deal built for me special. We vacuum bagged it on an Airex core. Airex is kind of hard to work with because of its narrow styrene window and the temperature control is critical. Scott’s guys made that boat so light they had to stop. They were getting it so light. I wish I still had that boat. Pero: Can a flats skiff be too light? McGuane: There is an endgame on lightness. Everything in those boats is a tradeoff. If you are fishing intensely, are you planning to strenuously pole the darn thing all day long, or are you making long runs? The trick is finding a boat you can make a 40- or 50-mile run with and then be able to pole it and not get killed while you are making the run. All of those things have to be considered. It is a very tough dynamic to work through. That is why the evolution of equipment has been exciting. I am always dying to see what is next. I do think we have hit a wall with the evolved-out Mavericks and the evolved-out Hell’s Bays. I do not see what the next opening could possibly be, unless it’s the niche specific boats for the Everglades or Mosquito lagoon. Pero: What first attracted you to the Florida Keys? McGuane: Everybody read the winners in the Field & Stream fishing contest every year, and I would go to the bonefish and snapper category, the tarpon category, and the permit category. I must have still been in college. I would look down and all it would say was Big Pine Key, Big Pine Key—everything was coming from Big Pine. I thought, I gotta get there. So I did. I got there. I moved to the next Key up and rented a house, and I even did some guiding for Woody Sexton. Anybody he did not want to take fishing, I would take—the underprepared, the cheap, and the obnoxious. Pero: Did you move from Michigan? McGuane: From California. I went straight from Stanford down to Big Pine; I had all the college I wanted. There was a little place there on the Coupon Bite side called the Sea Center, if you were besotted by this whole thing, as I was, I mean it was unbelievable. It was a kind of low-roof shed where the canal came in there was a skiff, skiff, skiff, skiff, skiff—each one occupied by a hero of mine: Jim Brewer, Arlin Leiby, Harry Snow, Woody Sexton. They were the people I really looked up to. That was my first immersion in this world. Pero: Had you been fishing in Florida before? McGuane: We had always gone down there. I had a younger brother and sister. When I went away to school my family all moved to Florida. But all through my growing-up my dad would take me fishing at Boca Grande or down to the Keys, so it was always part of our life, though more part of my dream life than my real life. I could not wait to get there. Pero: Let’s consider the tarpon—please read this from “Tarpon Hunting” from your collection of sporting essays, An Outside Chance. McGuane: An awareness arises of the distinction between a species like the tarpon and the offshore pelagic fishes with which, as a game fish, the tarpon is often favorably compared. But in the tarpon the aeroodynamic profiles and chameleonic coloring of blue-water fish are replaced by something venerable; they are inshore fish, heavily scaled; they gulp air; and as if to seal their affinity for the land masses of the earth, they require fresh or brackish water to complete their reproductive cycle. They migrate, as many fishes do, and when we touch or intercept these migrations, we sense, subliminally the dynamism of the biosphere: tarpon migrate by season, season is a function of planetary movement, and so on. Which is no more than to say you can face bravely those accusations of loafing when you have ruined a month chasing tarpon, racking your brain to understand their secret, sidling lives. Pero: What are your earliest memories of being excited by fishing? Everybody read the winners in the Field & Stream fishing contest every year, and I would go to the bonefish and snapper category, the tarpon category, and the permit category. I must have still been in college. I would look down and all it would say was Big Pine Key, Big Pine Key—everything was coming from Big Pine. I thought, I gotta get there. So I did. McGuane: Oh, well, they are extremely early memories. I remember I was visiting two people who were supposed to be my aunt and uncle—you know, we always had those so-called aunt and uncles. They were really just friends of my grandfather’s in Townsend, Massachusetts. Through their backyard went a little stream. I suppose I was four years old. And I crawled down to that stream and I looked over the bank and there was a little school of brook trout hovering in the pool. My father said I seemed to have had an epileptic fit. He picked me up and rescued me from the paralysis of seeing these fish. I really do actually remember this. For some reason I have been very excited about fish ever since. When I was a kid, I used to tell everybody I was going to be an ichthyologist. I had an aquarium. I would lie in bed with the lights off and just the aquarium light on. I usually went to sleep at night staring at the fish in the aquarium. Pero: Your father was a fisherman. McGuane: Yes, and my grandfather. “Not very good,” said Frank. “That surprises me,” said Holly. McGuane: Yeah, that is out of real life. That was a great shock to me. I must have been 30. An old friend of my father’s—whom I called Uncle Ben, who of course was not my uncle—came down to the Keys when I was living there. He booked Harry Snow, Jr., one of my heroes and whom I was half scared of. We went fishing and while we were in the boat we had that conversation. He routinely asked what kind of fisherman so-and-so was. I think I was not really prepared for the answer. Yeah, my dad was avid when he could be. He got away from it as he got older. He was an athletic person, but he was not a very cerebral angler. He just kind of muscled it out there and hoped to catch a fish. Pero: Mostly trout streams in Michigan? Pero: Key West. Tell me what it was about in your years there. What are some of your most vivid memories? McGuane: I first went to Key West as a kid with my dad but have only superficial recollections of that visit. As a bookish boy, I was aware that the place had a long literary history whether it was Tennessee Williams, Ernest Hemingway, or John Dos Passos. For some reason it has always been an attractive place to writers, because until very recently, it was really like a foreign city in America. Old domino players were out on the corners. And it was not remotely fashionable until the 1970s. I remember when I lived there it was a cheap place to live and when my parents would come down to visit there was really only one place to take them to eat—the A&B Lobster House, or maybe El Cacique which was just a café. There was really no other place to go. I bought a house right down in the old town down by the ocean, a spectacular place on a huge lot. It had three little conch houses on it. I remember I paid $28,000 for it. That piece of property is now probably worth $5 million. Pero: Only three decades ago. McGuane: I had just had a movie sale on my first book, a little money to toss around, and no tax problems because I never made any money before. In those days, Key West still had the feeling that it was an old town with very interesting architecture. The conch people who had settled it were still there; they have all moved out now. There was a substantial Cuban population and there was a substantial black conch population—real West Indian people. They were not anything like American blacks. They did not sound like them. They did not think like them. They were commercial fishermen and had their own culture mostly down on Petronia Street. So for a young literary type, it was a pretty exciting atmosphere. And I had the only skiff in Key West. Pero: I like your description of Key West in “The Refugee” from Gallatin Canyon. McGuane: He kept inhaling deeply, surprised after his long absence at the familiarity of Key West night air, the particular humidity, the scent of more flowers than occur in nature, salt water, and faint indications of humanity: tobacco, perfume, automotive exhaust. It was a perennial aroma occasionally subsumed by a single smell, new house paint or Sunday- morning vomit. All in all, it made his heart ache. Key West seemed a most appealing landfall. Old-timers used to tell him that before the aqueduct and plentiful fresh water, the place was a kind of gooney-bird island, not much greenery and plenty of exposed cap rock and coral. Now it was as lush as Hawaii, an easier sell. Pero: How was the fishing? McGuane: There was fishing all around that was like taking candy from a baby. At one point tarpon fishing was too easy to be interesting. There was one bank that ran off to the west from Mule and Archer Key that was infested with juvenile tarpon anywhere from 15 to 45 pounds. When I had guests down, or when I had a little assignment from Sports Illustrated and one of the editors wanted to go fishing, I would just pull into that bank and we would get 100 shots at tarpon and put 20 of them in the air. Those fish are not there anymore. The other thing is, this is when the mutton snappers were still abundant. And that is a great game fish—tailing mutton may be my favorite. It was a pretty innocent kind of world. The fishing was all concentrated up around Big Pine, Little and Big Torch, and Summerland Key. It was great fishing and would run out to the Content Keys. Thanks to Stu Apte there was a nickname for every one of our fishing places like “Broken Legs” or “Eccentrics.” We had all these names for places so nobody would ever figure out what you were doing. But very few people had gone to Key West. I moved down from Summerland to Key West and we had the water to ourselves. Now the opposite has happened. Everybody has gone to Key West because guided clients can stay in nice hotels and go to dinner after fishing. If I were going back there now, I would go back to Big Pine because it has gotten much quieter up there and a much more innocent fishing scene. I was talking to Carl Hiaasen… you know Carl, don’t you? McGuane: Carl says he thinks that the tarpon thing in the Keys has gotten to be too much. You go out with eight skiffs staked up on Buchanan Bank and kind of wait for something to happen. So he waits for those little warm spells in the winter when nobody is there and goes tarpon fishing. Pero: Where did you live at Summerland Key? McGuane: I lived at Loggerhead. My house was at Summerland Key, and there was nobody there. I suppose I was four years old. And I crawled down to that stream and I looked over the bank and there was a little school of brook trout hovering in the pool. My father said I seemed to have had an epileptic fit. He kind of picked my up and rescued me from the paralysis seeing these fish. McGuane: On the point of Loggerhead there was a great stakeout place, but inside it was an elbow bank that would take you about three hours to pole through. The little guiding I did I would just pole there. You go down the bank and you get a bonefish shot, then you get a permit shot, then you slip out to four feet of water, get two or three tarpon shots, go up to the top and do it again. It would cost me 25¢ of fuel to run from my dock to Loggerhead. For others, going up there used to be an expedition. George Hommell would trailer up from Islamorada. I actually lived on top of it and had it to myself for five years. Pero: Anglers fishing the tournaments, in particular the Gold Cup, they are not allowed to trailer to Loggerhead so they run all the way from the dock at Islamorada. McGuane: Hmmm, I cannot even think how far that is. Geez. A run from Islamorada? Holy moley. I have a friend, John Willis, who lives in Islamorada and he kept telling me about going to Loggerhead the last couple of years, but I suppose he trailers his boat. Pero: Who was the best tarpon angler you knew? McGuane: The guru in those days was Stu Apte. Some who have heard quite enough about Apte may not appreciate my saying this, but he had a real genius for it. He really laid the original tracks for tarpon fly fishing. He was a great, intuitive tarpon fisherman. Pero: Tell me something about the old-time guides—their characteristics, their approach, their connection with the environment. Pero: Was his prowess up to your idolatry? Pero: You used that competitive tension, that angry tribal energy among Keys guides, as your narrative theme in Ninety-two in the Shade. McGuane: One of the crazies burned up Stu Apte’s skiff. I would get sued if I used his name, but one guide in particular was really a dangerous person. He was a murderer from Kentucky. He paroled out and was down there and he was a very good fisherman, but you did not want to cross him for any reason. There was one bank that ran off to the west from Mule and Archer Key that was infested with juvenile tarpon anywhere from 15 to 45 pounds. When I had guests down, or when I had a little assignment from Sports Illustrated and one of the editors would come and wanted me to take him fishing, well, I would just pull into that bank and we would get 100 shots at tarpon and put 20 of them in the air. Pero: Was he your model for Nichol Dance? McGuane: Yeah, a little bit. He would remind you of a West Virginia mountaineer type, you know, humorless, cold. I remember one time I came to the dock, and I caught a 26-pound permit–because I planned to eat it—and I came in to refuel and this character is there and he looks over and says, “I guess it will fry up good.” Suggesting it was a tiny permit. He was a great permit fisherman. He was pretty much a bait fisherman. He was the oddest character because he had this black, dark background, but was married to the sweetest, little school teacher. That was kind of strange. But there were other friendly guides, although even they tested you before they accepted you. Bill Curtis and I got really crossways once. We ended up being friends but it looked like a lethal duel. Bill is enough of an Indian to go haywire if you get him mad. Pero: What about the new generation of Keys guides? McGuane: When I was there all these yuppie flats guides had not arrived. They were not there. Probably these new waves of guides are the best guides that have ever been down there. Some of these younger guys I have fished with are phenomenally good guides—there is no question about it. But that yuppie deal is a long time wearing off. Pero: My understanding is that there are some 500 bona fide flats guides operating in the Florida Keys today—500. And the circus continues. I have heard, and I believe it is true, that there is some guy in jail right now who strafed a competing guide’s doublewide with a semi-automatic rifle. McGuane: That’s the new spirit! Pero: There is a story about a guide who several years ago pulled into a mini mart one morning trailing his skiff and there was some other guy with a skiff blocking the gas pump. The competing guide’s truck door was open. The guy goes into the mini mart and demands he pull forward and the other guy says, “I will move as soon as I finish paying here.” So the steamed-up guide gets back in his truck, floors it, and proceeds to take the driver’s door off. Pero: What is fascinating to me is that there have been several generations of guides who have gone through more or less the same thing. There are exponentially more guides down there now bumping into each other compared to when you were living in the Keys, and yet among only a handful of guides was there still this cutthroat undercurrent. You ended Ninety-two with your nasty guide putting a bullet through the novice guide’s heart! McGuane: Nothing new. When I realize how fraught it was when I was there 40 years ago, I shudder to think how bad it is now. My take on tarpon fishing then and now—because I still tarpon fish—was always something I wanted to do by myself or with a friend. I was never a competitive tarpon fisherman, in some ways maybe not even a driven one. I would quit tarpon fishing if there weren’t fish on the flats. And I probably put more effort into permit fishing than anything, but I still tarpon fish a lot. I was tarpon fishing a few weeks ago. I have a little electric motor on my Hell’s Bay skiff. I get right out and get in a good slot and jump some fish. That is coming from me, a lifelong driven fisherman, but in these golden years I’m trying to find some meaning in fishing. By meaning I do not mean self-aggrandizement. It has to be renewed pretty regularly, because if I cannot figure out myself what it means or why it’s important, I just won’t do it. I would rather go bird hunting or ride cutting horses than just go out and try to run up some numbers or win some kind of a contest. It is a struggle because I am not always sure what fishing means. I know it is a compulsion and I feel that way about tarpon fishing. I have to see what is in it other than what I read about as being in it. I was down in the Keys and somebody told me Andy Mill was using 32-foot leaders on some of these fish. And I said, “That’s it!” So I need to talk about meaning instead of philosophy or something like that, but still I could not wait to get back to Boca Grande and make up a 32-foot leader because I was spooking a lot of fish with my 12-footer. The idea of a guide in short pants was absolutely out of the question. I mean you could not get them in shorts with a gun. Typically they were dressed in a khaki shirt with their name over the pocket, khaki long pants, and we did not have sunblock or anything like that. Pero: Tarpon seem to thrill each of us individually. To some, the adrenalin rush is triggered the exact moment during the hunt when we spot the fish—or the guide yells, “Ten o’clock, coming right at you!”—to others it’s the bite, or that first crazy leap. What does it for you? McGuane: It is something different throughout tarpon season. It is always changing. For example, it is always a big thrill for me in March to run to some little place that I like to go when I do not know if the tarpon are around yet. Even in a good time or good tide, but the wrong time of the year. I am just going to float out there, waiting to see if anything happens, and usually nothing happens. But there always comes that day when I see that first fish roll, and I know this thrilling seasonal phenomenon is about to begin. I would like to catch one, but just the fact that oh-my-God, it-has-been-a-long-winter-and-they-are-here… that is always an epiphany for me. Last year I got the feeling that maybe they were around or had been around and I was missing some clues. I ran over to the mainland from Boca Grande in the dark, and I was just looking at my GPS screen, just screaming across Pine Island Sound. I got staked up on this bar which I thought might be the place if they were really coming in. We’d had about five days of really warm weather, the water temperatures were rising. I just sat in the boat waiting for the sun to come up. And when the first light of sun came I thought I was in an asparagus patch. I was sitting in about 2,000 tarpon that were laid up, 30 degrees with the tips of their tails out of the water, sound asleep. They were everywhere. I remember thinking that the top of my skull was going to blow off. It was just such a thrill. By the way, I never caught a fish that day. You could not feed them. They just would not eat. That is always a big thing. It is always this kind of puzzle you are trying to unravel. This last spring, probably the biggest turn-on for me was I had gone out fishing with a guide friend of mine—which is not something I often do—and we had found quite a few tarpon but we could not get lined up on them. They were either bouncing off this one turn or they were going sideways to us. This is where the 32-foot leader would have solved it! Nothing was working. We never caught a fish. I was struggling about it during the night trying to think what was wrong and I thought, I have an idea. So I went out the next day and I went to a place where there was a bunch of down timber on the beach. There was a piece of dark bottom and then there was a little white strip. It was a place I knew where tarpon generally in that area would turn out into the gulf. And I thought, I think this might be a good place to line up. So I went out there and anchored. It was in about six feet of water. I started watching this little point and pretty soon the tarpon started coming—straight at me and they were visible for a long way. I ended up jumping a bunch of fish. I caught one about 120 pounds, which I had sitting in front of my boat with my electric motor going: grrr, grrr, grrr. When I was talking with Russ Chatham the night before last, he was talking about coming to Boca Grande and fishing sink-tips for these pods of fish that come by on the bottom in about six or seven feet of water. Of course, he comes from that other tradition of fishing. McGuane: He said, “You cast out and lead enough to get that sink-tip down to them and a couple of strips.” And he would say, “Humff, into one!” He said the main thing was you would look down there in this pale green water and there is a bunch of brown fish out there but you are getting this huge silver flash off the bottom and that is the one you hooked. He said it is just so thrilling. I do not know if it is the predatory instinct that kicks in but there is some kind of major chord that goes off when that happens. Pero: When I interviewed Ted Hughes a number of years ago he talked about a kind of psychic switch going on. McGuane: I remember that. He talked about the sick grouse. McGuane: That was a very, very vivid moment. Pero: And how when we hunt—for fish or for game—we are intensely alert to the whole landscape and the life in the landscape. He talked of looking out a train window and seeing the ears of hares sticking out of the corn. McGuane: Like the landscape lights up. Some of these younger guys I have fished with are phenomenally good guides—there is no question about it. But that yuppie deal is a long time wearing off. Pero: Instantly all the circuits are suddenly reconnected and we are restored to our real selves, our biological inheritance. Pero: Back to Ninety-two in the Shade and the menacing fishing guides you turn the tables on metaphorically as your protagonist Thomas Skelton takes on his nemesis, Nichol Dance. McGuane: Flame zigzagged up and down the boat’s interior with a sucking noise until the entire thing was afire. Low in the water and swimming through darkness toward the far side of the basin, Skelton could no longer see the five people crossing the street. Then suddenly they popped up on the dock. Carter and Dance boarded Carter’s skiff and the engine started with a roar. They jumped the skiff up to planing speed, then shut down abruptly as Nichol Dance’s skiff coughed into explosion, a ball of flame blowing flat out sideways through the hull, then up like liquid into the sky, pieces of the hull soaring up in the fountain, one piece sailing like a comet over the joyous face of Skelton, trailing flame and fire. Then the boat sank so abruptly that Carter and Dance vanished in the darkness like Skelton. Pero: About tarpon—considering the fact that you were literally surrounded by them night and day in Key West while writing the book. In fact, the most extensive piece about tarpon is a humorous little aside where Skelton casually goes out at night and takes a few casts off the dock. McGuane: Bill Schaadt used to come down and stay with me, and he would wander around town fishing off the docks in the shrimp-boat basin, catching more tarpon than anybody in a boat. So Skelton slipped into their garage and got his fishing rod, walked half a block to the corner of Front Street to the Dos Amigos bar, had a single bourbon and water, shot one maladroit game with eight-ball with a counterrevolutionary Cuban shrimper who claimed to be able to navigate from here to the north coast of Haiti without chart or sounding because “I am a Key West captain”; then he took up his rod and crossed Front Street at last light and walked down to the pocket beach that lay between the fabric factory and Tony’s restaurant. It was dark and warm as summer, and tarpon were assailing bait under the restaurant lights; there were maybe a couple of dozen fish striking the lit up water and shrimp were clearing the water completely and kicking out into the darkness. Directly above the fish, out of the corner of a balustrade, a man in a white dinner jacket was pressing at a girl in a gown, hauling her against the iron balcony, mashing into her with his face and holding his cocktail perfectly balanced out over the ocean without looking at it. Skelton climbed out onto the transom of a half- beached skiff and chopped a cast right into the working bait from his lair in the darkness. He made one strip and came up tight on a tarpon. The heavy fish just held his own a moment, trying to think what had happened; then it vaulted high and terrific into the light, right up clear to where its gills rattled alongside the balustrade. Gordon spun; and Natalie dropped her jaw. Gordon glanced ornery into his empty glass, looked at Skelton’s line trailing into the darkness, and led “Nat” to an empty table inside, his moment quite gone. That is one of the things Schaadt used to do. The other thing that Schaadt would do is—now here is a real tarpon kind of guy!—rig up a kind of Bosun’s chair on a block-and-tackle kind of a deal, where he could raise and lower it himself with a line—two going under the seat and one to raise and lower. He would go out to those bridges on the falling tide during the crab hatches when all these tarpon were jamming up under the bridges. He would lower himself down under the bridge. Everyone else is trying to figure out what he is doing, and there is Schaadt down there jumping tarpon after tarpon. He would also jump them right in the shrimp basin from land… big ones. Pero: The movie Tarpon, which has been a sort of underground cult classic for years among tarponheads, has just been released on DVD. How did you come to know Guy de la Valdene? McGuane: I am not much in the Tarpon movie. One of the things that was happening at the time is I was trying to make a living. I would work and I would go out when I could. All these friends and all these people came down and just kind of camped down there. They were not doing a damn thing except playing. During those years I fished opportunistically when I could. I wrote a piece about permit fishing that was in Sports Illustrated. I was in Montana by then and I got a letter from Guy telling me he liked the story and hoped that we would fish together at some point. Pero: Out of the blue? McGuane: I did not know him. He just wrote me this letter. I forget what year that would be. I think I got that assignment as a result of Ninety-two in the Shade, so I suppose it was 1974 or something like that. So when I went down there I touched base with him. Guy would hire Woody Sexton or Stu Apte and fish for months. He gaffed Stu’s world record. Pero: Where did Guy come from? McGuane: Guy is from Palm Beach, but his father is a French count. Guy is a count himself actually. Pero: You dedicated Something to be Desired to him. McGuane: We have been long time friends. I hear from him nearly every day. Guy’s father was an inventor and he was a consultant to submarine military stuff and was in the Lake Okeechobee area testing equipment during WWII and met his mother there. Until his father’s death, Guy would go back to France every year. He was raised in France. He might have been born in France, I do not know, but he is bilingual and a real sportsman. He is a very good tarpon fisherman. He is a great poler. He was an oarsman in college. He is very strong and a good, steady poler. We fished together a lot; we still do from time to time. These days we hunt together more than we fish. Pero: How did the film come about? McGuane: Guy was doing a lot of photography in those days. His sister married an outstanding French cinematographer named Christian Odasso, who is ailing right now. And they teamed up with this idea to make a tarpon film. Gil Drake signed on to guide and help with the underwater photography. Gil was one of Guy’s oldest friends. Deep Water Key in the Bahamas was the Drake family business; you know that fishery. So they went back a long way and then the cinematographer came into the picture and the project started to coalesce. Pero: But you really were not much involved? McGuane: I had a limited amount of time to fool around because I had to work hard every year to survive. My style of fishing then was to work and then pole the boat and fish from 6 p.m. until dark, or get up early and fish or fish whenever I could. It was only a part of my life. I could not stop to be a full-time fisherman. You know that was not really going to work. It might even be that the kind of uproar over all the stuff going on was something I was not keen on at the time, I really cannot remember. It turned out to be a very interesting movie, although they were not able to sell it originally. It has gotten more popular now. Pero: It is. I have a copy right here. I just watched it last night on my computer. You do have a forgettable line, though. McGuane: A forgettable line or an unforgettable line? McGuane: I like that better than mine. That is a pretty good Brautigan line, actually, because this year I have been redfishing a lot and the first tarpon I caught this spring, I remember I hooked this fish and it jumped about… it did one of those real rocket launches about 25 feet from the boat. My mental status was in trying to catch a redfish. I remember thinking, Jesus Christ, that is a big fish! It is startling. Pero: And they are old. Pero: Do you know about the tarpon at the Shedd Aquarium in Chicago? Pero: In 1998 a tarpon jumped out of its enclosure at the Shedd. It had been there since 1935. Sixty-three years later it committed suicide. When it was captured from the wild it was already nearly five feet long. McGuane: Oh my God, that is one of the most amazing things I have ever heard. Pero: Jerry Ault, the top tarpon biologist at the University of Miami, figures it was at least 10 years old when it was caught. The growing consensus among knowledgeable scientists is that many of these fish are 70 and 80 years old. McGuane: That is unbelievable. I had 40 or 50 years in my mind. I knew they were very old. So 1935 to 1998? I have to tell Guy about this.